I Kings 19:12 And after the earthquake a fire, but the Lord was not in the fire. And after the fire the sound of a low whisper. Today’s thoughts are from Knowing-Jesus.com. Click the title below to read at source, and then click the tabs on the right margin to source other resources. Well, it didn’t go just like that, but you can see in the verse above that according to the language of his day, he thought himself to be a pretty neat guy. Bad move! What did God do? Something He didn’t do too often. He intervened orally. He spoke directly to Nebuchadnezzar. And what was His message? It was this. I am God and I do whatever pleases me. Anything you accomplish is because of my will, my work, my decree. Now to get Nebuchadnezzar to see this, He had to take care of the issue, which was Nebuchadnezzar’s pride. And to accomplish that, God humiliated him. God always does things for a purpose and the purpose here was to show the ole king who God is. 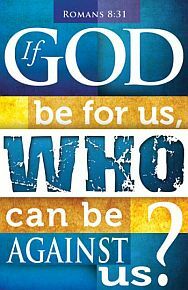 And who is God? He is the one who “rules the kingdom of men and gives it to whom he will.” In other words, there is no room for boasting, save in God in heaven. Not ever. Not anyone. Have you accomplished something? Great! Give God the glory. Many struggle with the idea that God is sovereign even though He tells us over and over again in His word that He is so. This is just another example and a pretty nifty one at that. It’s almost as if He decided in Heaven that it was high time He joined the conversation, even though briefly. And so what did Nebuchadnezzar learn? What did he declare when he came to his senses? Read carefully and take note. Is there anything more we can add to this? Let us learn from the interesting case of King Nebuchadnezzar, who had the Lord of heaven and earth intervene in his life in a most unusual way – all to make the point that He is God over all. Let us get the point and imitate good king Nebuchadnezzar. Over the past six months I’ve discovered that launching a blog of this nature is much more challenging than when I launched Thinking Out Loud earlier. 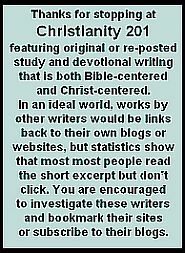 People will gravitate to topical articles, humor, cartoons, links to other blogs, and the latest gossip information about famous Christian individuals. Even theological and doctrinal blogs will get a good following because people love a good debate. But it’s the people who are serious about their faith that will seek out a devotional blog. They want something that digs a little deeper, that cuts to the heart, or that processes things at a 201 or 301 level instead of just Christianity 101. (And I confess that I some days, we don’t always get there.) What is he speaking to fellow believers on the internet? What is God saying to me today? First, fervently and frequently ask God to improve your hearing. Pray every day for God to give you ears like the prophet Samuel’s. Ask Him for increased capacity to discern His voice and for heightened attentiveness to his promptings. Second, reduce the ambient noise in your life. For me, a sure way to get quiet before God is to head off solo on a boat. For you, it might be listening for Him while you are driving, exercising or enjoying the quiet of your bedroom at night. Wherever it is, be sure to carve out moments in your day when you can practice listening for the voice of God. Third, you simply must fill your head with scripture… Most of the promptings we receive at critical decision points in life come as the Holy Spirit reminds us of scriptures we already know. 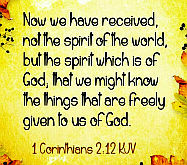 We hear whispers that reinforce Biblical truths and we understand immediately what the Spirit is trying to say to us. So saturate yourself with God’s word and see if His whispers don’t increase over time. Finally, the Bible makes it clear that any ongoing pattern of wrongdoing compromises our communication with God — in both directions. Our prayers don’t get through to God and God’s promptings don’t get through to us. If you are stuck in a rut of sinfulness and deceit, confess your sin and turn away from it today. Let the laser light of truth permeate every corner of your life. Don’t truncate your communications with the Father because you’re unwilling to let go of a sin pattern in your life. In the days before Thinking Out Loud, I enjoyed reading other bloggers including Jim Lehmer. He called this post, “My Second Favorite Bible Verse.” You’ll have to read it at its source to find out his first favorite! The LORD said, “Go out and stand on the mountain in the presence of the LORD, for the LORD is about to pass by.”Then a great and powerful wind tore the mountains apart and shattered the rocks before the LORD, but the LORD was not in the wind. After the wind there was an earthquake, but the LORD was not in the earthquake. After the earthquake came a fire, but the LORD was not in the fire. And after the fire came a gentle whisper. When Elijah heard it, he pulled his cloak over his face and went out and stood at the mouth of the cave. That last question is enough to keep you up nights, you know? Today’s post is from Keith Brenton who has been writing at Blog in my Own Eye since 2004. This first appeared in August under the title, Speaking for God. “We speak where the Bible speaks, and are silent where the Bible is silent.” ~ unofficial motto of (most) churches of Christ. Isn’t this one of the heaviest burdens carried by those who truly desire to speak for the Lord? Whether preaching, teaching, writing a blog, or just conversing about matters religious with a friend? How do we know when we’ve stopped speaking for Him and started rattling off our own perceptions about what He’s said? Isn’t it pretty important to stick to what He’s said? And after all, aren’t there plenty of powerful speakers with advanced degrees in biblical studies who don’t agree on what He’s said? I wonder from time to time if this doubt isn’t one of the most powerful tools Satan has in shutting us up about the Savior. I wonder if it’s one of the un-discussed root causes for preacher burnout and parishoner abandonment of evangelism. I wonder if we’ve made the gospel more complex than it is. Would you like to know what gives me hope when I try to write or speak on the Lord’s behalf – however imperfectly, humbly, and haltingly? The Spirit of our Father speaks through us. We just leave it to Him. It happened just as Jesus described it to His followers. And Paul writes to Corinth that it still works that way. It’s a simple message (“Jesus is Lord!”), delivered in a simple manner, through simple people like you and me. No advanced degrees required; just the Holy Spirit speaking through us. And all we need do is ask for His help. I have resolved to take a new approach when disagreeing with others about scripture, or when trying to argue toward a common understanding of God’s message, or whenever I feel compelled to speak for God. I’ve resolved to pray for the Holy Spirit’s discernment for all parties involved, including (especially!) myself. I can be as opinionated and pig-headed and closed-minded as anyone else I know. 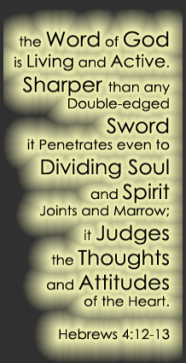 I need to be more open-minded … no; not so much that my brains fall out, but so much that His Spirit can fall upon me. I need to make room for God’s understanding, even if it pushes my understanding out through my nose and ears. So I’m asking you to pray the same thing for me. If I could sit with you, I would tell you that sometimes we can hear God talking and sometimes we can’t. I would tell you that when we hear him talking, you don’t actually hear anything with your ears. I would tell you that you hear it anyway, that is probably isn’t an essay, it’s probably just a couple words. But you know when it’s God. If I could sit with you, you would ask me how you know for sure. Because, you would say, all the time you have thoughts that you think could be God talking, but you want to be sure they aren’t wishful thinking. Especially when those thoughts are telling you how stupid you are. Especially when those thoughts are too convenient and fun. Then I would tell you about a shepherd, one that never calls sheep stupid. Think about a shepherd who spends time around his sheep, talking enough that they know his voice enough to recognize it. They have heard that voice talking to the sheep around them. They have heard that voice talking to assistant shepherds. They have heard that voice talking to them, calling them by name. How would a sheep be confident about the voice of the shepherd? By knowing that there are strangers who wander by. By knowing that there are hired hands who don’t really care. By knowing that it is important to listen. By spending as much time listening to that voice as possible, listening for tone of voice, for topics, for style of talking, for consistent concern with sheep welfare. Then I would ask how much time you and I spend actually listening, reading letters, reading stories, being open to hear. We may not hear much, but we will hear more clearly than if we never listen. I break the main rule of blogging by posting here at the very end of the day in a time zone that is even more at “the end of the day” in a worldwide sense. I’ve used this space to force myself to come to grips with what, if anything, I’ve felt that God has shown on a daily basis. This was a holiday in Canada and for some people days off can be very lonely times. I’ll bet there are people who are dying to get back to work tomorrow. But I’ve always found times alone can be very introspective; a great opportunity to be more attuned to whatever it is that God might be wanting to show and teach us. I needed a blog with low stats to keep me humble. Actually, that’s not why I started this. You can read the April 1st post to get the 411 on that. It’s hard to believe it’s been a month. I find posting at Thinking Out Loud to be a breeze compared to this, even though its posts are two to three times longer. On this blog, I wanted to write daily posts that were free of tangents, free of peripherals, free of distractions. As the month progressed, I realized what I was asking myself to do was keep a record of what God was speaking to me or reminding me of that day. And it was hard sometimes because I had crowded out God’s voice that day. But realistically, that shouldn’t have been the case. We should enter each day with a spirit of expectancy. God is trying to communicate all manner of things to us, if we will just listen, if we will just tune our hearts toward Him.